In the weekend Brody and I had our first proper go at a Rally-O Competition. It was a ribbon trial at the Ardmore Exhibition Centre. Rally-O is a new sport that has only recently been recognized by the NZKC as an official sport, that you can gain titles in. It consists of a course of heel work, and many other activities such as turns, sits, downs, weaving through cones, recalls etc. The course is set out with signs that you walk around before your round. 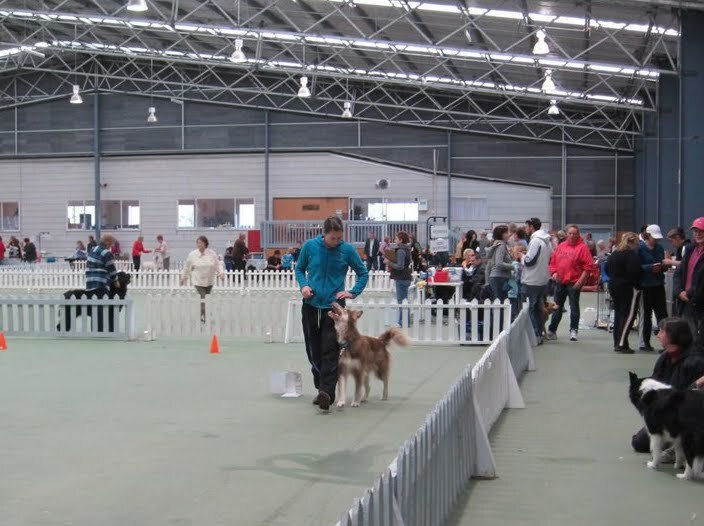 I was a bit nervous, because I have given Brody a BIHG break from obedience due to his epilepsy, and how anxious he was getting in the ring when doing obedience competition. When it was our turn to go in the ring I tried really hard to be positive and happy even though I was a little scared about getting lost or doing the signs wrong. I also aimed for speed.... because you are placed based on your time, and I thought it might be better to keep Brody focused if I was moving fast! I was SSSOOOO happy with how Brody worked in the ring. He was happy with a wagging tail, and enthusiasm. He tried really hard the whole round, and did everything properally. The picture above shows him 3/4 through the course doing his slow pace. Our round had no deductions, so we got 100 points, and then it went on our time for the placing. And we won! Now I'm looking ahead to the upcoming champ shows so that I can work towards getting some Rally-O titles for Brody. Your performance was really cool and pleasant to watch! I can't wait to see your runs at the next competition. I also like staying in my crate, so I often go into my crate voluntarily and have a nap in there at home. But, it is a different story when there are other dogs around me. Maybe my Mum should watch the DVD of Susan Garrett crate games, as she hasn't seen it yet. Way to go Brody...you are such a Superstar doggie! !